Travis d'Arnaud is sticking around, but Anthony Recker will be temporarily demoted to Triple-A with John Buck returning from paternity leave.Travis d'Arnaud's minor league career appears to be over. 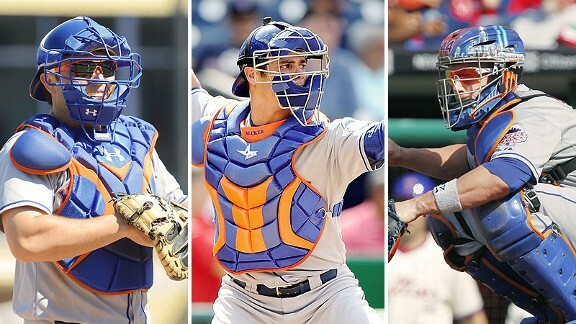 D'Arnaud is remaining with the major league club, the Mets announced after Monday's 6-1 win against the Minnesota Twins. Anthony Recker has been optioned to Triple-A Las Vegas, presumably until rosters expand Sept. 1. The Mets needed to make the decision with John Buck set to return from a three-day paternity leave on Tuesday. "In our opinion -- and this is Sandy [Alderson] and I and the coaches' opinion -- the only way this guy is going to improve is to be here," Terry Collins said. "He'll work with John Buck ... to learn from certainly that quality veteran." D'Arnaud is 0-for-7 with five walks through three major league games. "Even though he hasn't got a hit yet, he's been on four or five times because he works the count," Collins said. "So he brings a lot to the table." While d'Arnaud is due to get the bulk of the playing time, Collins indicated Buck will not get buried on the bench. "They're going to both play," Collins said. "... John Buck deserves some playing time, and he's going to get playing time. I'll discuss that when I get to see John." Recker is hitting .193 with five homers and 16 RBIs through 109 at-bats this season. "Anthony Recker has done an outstanding job," Collins said. "That is a tough job, to sit here and play once a week, once every eight or nine days. As I told him when I sent him out -- I don't have the exact numbers -- but we've won more games than we've lost when he's caught (16-11 in Recker's starts). He's handled the pitching very well. He's dangerous. He's big and strong. He's done an outstanding job. He's going to be back in a couple of weeks. "We just think, as we look down the road, these other two guys we need to get them in there and play them. And we think Travis can learn a lot by staying here."